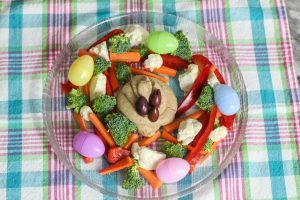 Looking for an easy appetizer, just because… or for Easter? I got it covered. 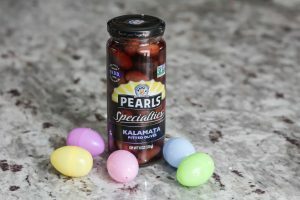 Pearls® Specialties Kalamata Olives are my favorite for salads, wraps and even on their own. 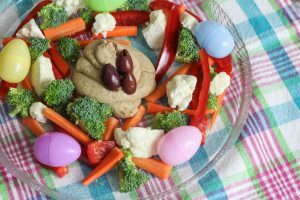 For the olive lovers, I created a hummus you will have to try. Snag some of our favorite Pearls® olives on Amazon or use their store locator to find a location near you selling them. Why Pearls®? Because this family owned brand has been around for over 75 years, which is why I was intrigued to try them in the first place. Freshly squeeze 1/2 lemon into a blender. Open and drain 1 can garbanzo beans. Pour drained garbanzo beans into the blender. Add 1/4 cup olive oil, salt & cumin into blender. Blend ingredients until it becomes thick. Add garlic clove and water (start with 2 tbsp). Add kalamata olives and blend. At this point only add another 1 tbsp of water if you prefer a less thick hummus. Serve with some olives on top. For presentation purposes I put the hummus in a plastic sandwich bag and cut the corner. Then squeezed it out like icing. 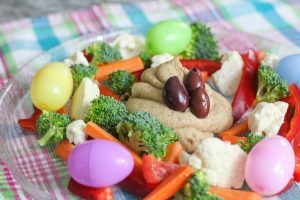 Depending on the celebration add festive pieces such as these small eggs to the plate. Ready to create this recipe? Find out where to snag your snacks olives here. Hi Babe! This looks so good! I love hummus and kalamata olives so much! A perfect combination! I love hummus! This version sounds delicious. I love a quick and easy, yummy recipe! oh girl this looks absolutely delicious!! Yas it’s my fav ☺️? ?